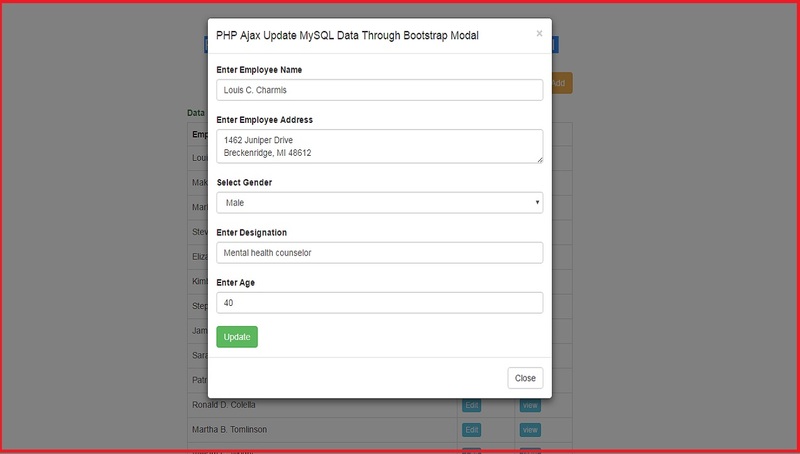 Hello friends in this post we are going to discuss how can we update data into mysql table data with Bootstrap Modal by using php script with Ajax jquery without page refresh. In previous tutorial on Bootstrap Modal we have show how to insert data into Mysql table by using Bootstrap Modal with PHP script with Ajax jquery. The main use of Bootstrap Modal we can do any type of database operation like Insert, Update, fetch and delete or display any message without opening of new page but we can do this type things on page in the form of pop up alert box. We can called this Bootstrap Modal by click on anchor tag or any button by using jquery code or we can also show Bootstrap Modal window by defining data attribute in element. Here we have use Ajax Jquery and by jquery we have get employee id from edit button, we have create all employee separate edit button with different id and in this id we have store employee id and by using jquery code we have get employee id from button and by using ajax we have fetch that employee id data from database and then after we have display that data into Bootstrap Modal html form field and in html form we can change data and by clicking on update button we can update data into mysql database by using Ajax request method. Buenos Dias solo se puede aplicar sobre una base de 4 columnas??? If you edit an employee, then immediately try to add a new employee, it overwrites the previously edited employee with the new employees info. Other than that, I like your work. Thanks! i want to update image, how can i do that?